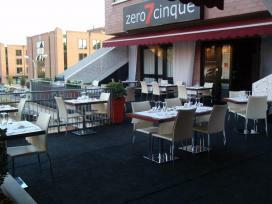 Zero7cinque is a local site in Perugia, in the small town of Via Settevalli. Opened in 2007, the room during the day has a lounge and a kitchen that prepares delicious dishes, from salads to pizzas, meat dishes and fish from the edges, is open from Monday to Friday for lunch and dinner from Tuesday to Sunday. At night, the Zero7cinque breaks out with disco music and concerts, showing the trendy side of the room. The design of the room recalls the colors of the Umbrian capital, the hues of red, white and black blend together to create a minimalist atmosphere every night. The restaurant has many parking lots in surrounding areas, a smoking area outside and an outdoor rooftop terrace for the summer.